Grand Duke of Luxembourg Henri and Grand Duchess Maria Teresa received German Chancellor Angela Merkel at the Grand Ducal Palace, during a visit to Luxembourg on January 12, 2017. The Grand Duchess looks a bit too casual to me. She looks nice but the top looks too much like a sweater for a meeting with a visiting head of state. Yes, that is true! Maybe it looks only like that on the photo an not in real life. I like Maria Teresa anyway. Angela Merkel is NOT Head of State, she is Chancellor of Germany, she is Head of Government. President of Germany, Head of State is Joachim Gauck. Okay, agreed. However I think that comment missed the point that Angela Merkel's visit warranted something better than sports wear. 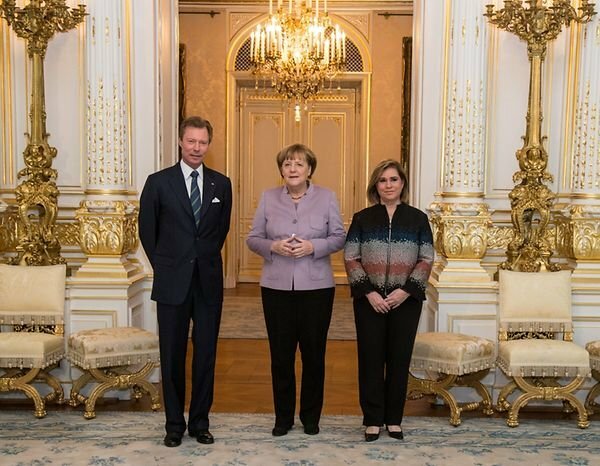 In my eyes Maria Teresa is wearing a knitted lumber jacket with a zipper. This is what elderly ladies with no fashion sense at all would wear when they shop their vegetables on the farmer's market. She did not even put make up on. Obviously she thought it's not worth it, because she knew what Chancellor Merkel would wear - one of her perpetual black slacks and one of her hideous ill fitting jackets in screaming color. Maybe she simply didn't want to outshine her guest. Because she knows how to dress when she wants to. The Grand Duchess looked positively beaming and appropiately dressed for the ocassion. Just because you are over 60 does not mean you cannot dress fashionable and chic. Princess Alexandra (Lady Ogilvy) and the Queen Sophia of Spain are two great examples of this fact. Angela Merkel could learn much from these two ladies. 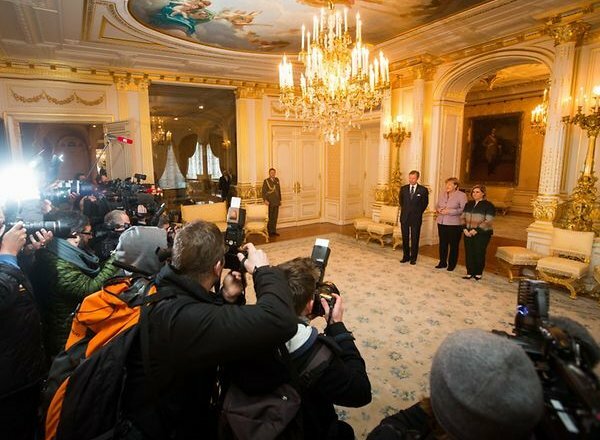 Angela Merkel is not into fashion and I doubt anyone would be interested what she is wearing. 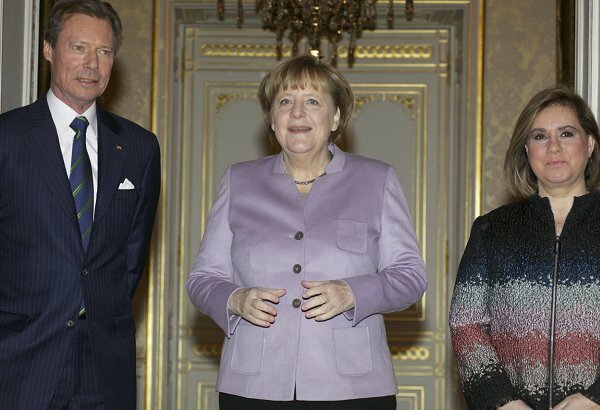 Angela Merkel is not into fashion. She is a statesman(or stateswoman). She is a brilliant politician in my opinion and that is her job. Please keep comments to fashion and starts again a witch hunt on Angela Merkel. Very stupid to bring fashion into the context of Angela Merkel. There was no need (my opinion)for the administration of this blog to publish this type of photograph. This blog has much to do with fashion. If you are a leader, what you wear is seen by many and reflects the person you are. A brilliant politician does not enable myriads of women to be sexually assaulted by the immigrants she is allowing into her country. Why is Renee comment on this blog. She/he is turning it into political issue. Administration please remove this from this blog. Renee didn't start political comment you did saying what a " brilliant politician "A. Merkel is. And we both Renee and I answered to your comment. So blame yourself and think before you write comments next time. A" brilliant politician" does not create chaos, disorder in their own country and she did not only in Germany but in all European countries. Because of her "brilliant" ideas we are all paying price for it. For that reason her popularity level plunged ! Thumbs up for you and Renee. Thank you Romana for having the same opinion .